Blog Quick Quotes: Friday Challenge 20! Happy Friday to everyone! Misty here and I hope you had a wonderful week that leads you into a fantabulous weekend! If you feel like making it a CRAFTY weekend, (hint hint) then I have the perfect project for you! 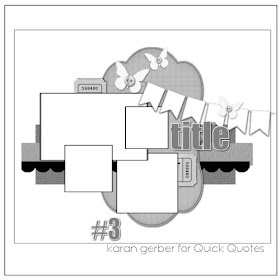 Take this GORGEOUS sketch created by our very own Karan Gerber, and create a layout based on it! There is one rule....you MUST include a quote. Now, I know that some of you may not have the Quick Quotes vellum quotes, so a quote in any other fashion is acceptable. You will notice that my quote is printed directly onto my photo in my example. This layout uses the Dreamscape collection. OMGosh it is a gorgeous collection!! The purples and blues are magnificent! I used my cricut to cut the die cut "trellis" shape and the petals for the flower. I tossed in a bit of lace and mini roses to create the outdoorsy feeling with a touch of elegance. Karan's sketch was a perfect inspiration for this! Create a project based on the sketch and include a quote. You can create a layout, card, mini album or altered art, just use the sketch as your inspiration and a quote with your project in some way. Challenge begins today and will be open until 11:59 pm PST on 10/26. Challenge 20 winners will be announced on 10/28! Oh my word... this is gorgeous!! Love the blues and purples in the Dreamscape line! I also love your idea of printing the quote directly on the photo! Thanks for a great challenge! What a fabulous layout! The colors of the line are so pretty. Thanks for the sketch - will give it a try! I had a great time with this sketch - and I always love to use my Powder Puff chalking inks! Thanks for the inspiration!